Summer is all about cookouts, and with it being late summer, these gatherings are still in full force. I’m not complaining one bit – the next few weekends for us are filled with plenty of get-togethers with friends and family. Obviously, it’s good to have several ‘entertaining’ dishes up your sleeve for these occasions. My husband is a big fan of coleslaw. With me, I could take it or leave it – at least, the stuff that you see pre-made at the deli and/or sold in bulk. 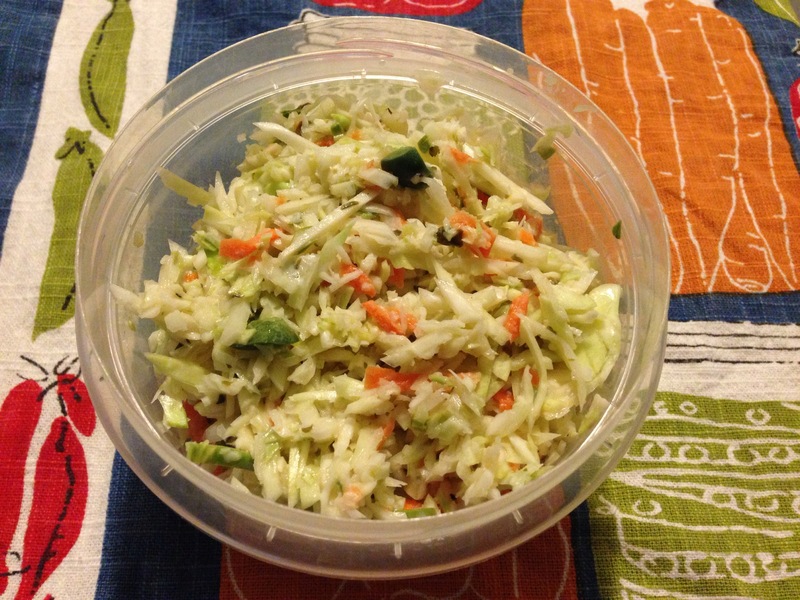 I had never tried my hand at homemade coleslaw up until a week or two ago. Now that I have, it might be safe to say that I’ve turned a corner of sorts. Don’t let the name fool you – this coleslaw does have a jalapeno pepper in it, but it isn’t overpowering at all. It gives just a bit of a bite. 3 tbsp cilantro, finely chopped – I used the stuff that they sell in the tube. Love it. Make the dressing: whisk together all dressing ingredients. Set aside (or in the refrigerator). Make the slaw: Using a mandolin, shred the cabbage; if you don’t have one, then finely chop it by hand. Combine the cabbage, carrot and jalapeno in a large bowl. If serving right away, pour dressing over vegetables and toss to coat. Add salt, pepper and/or sugar and season to taste. If serving later, refrigerate the slaw until ready to serve (or transport in a cooler). Mix everything together when it’s time to eat. I really enjoyed this dish. We brought it over to a friend’s house for a cookout where they were serving pulled pork sandwiches. It paired really well together. The cumin, lime juice and pepper give this coleslaw a Southwestern flair to it; you could easily serve this with chicken or with fish tacos, too. It tastes wonderfully fresh and beats the store-bought slaw, hands down. Then again, homemade dishes beat store-bought ones anyways, right? They say Labor Day is the end of summer, but don’t let it – keep on enjoying this great weather! This side dish, with Latin seasonings, is a great sidekick for tacos, enchiladas, or anything grilled. I served these with some of Skinnytaste’s Grilled Cilantro Lime Shrimp Kabobs (recipe coming soon). The dinner was quick, easy, and delicious – which means it’s perfect for the two of us! The fresh CSA tomatoes, garlic, and cilantro made this dish absolutely spectacular. In a small bowl, combine the garlic, lime juice, oil, cumin, crushed red pepper, and salt. Set aside; this is your dressing. In a large bowl, toss the beans, chickpeas, tomatoes, onion, and cilantro. When you are ready to add the salad – add the avocado & dressing; mix to combine. I assembled most of this salad in the morning before I headed out to band camp for the day – when I got home, I mixed up the dressing. 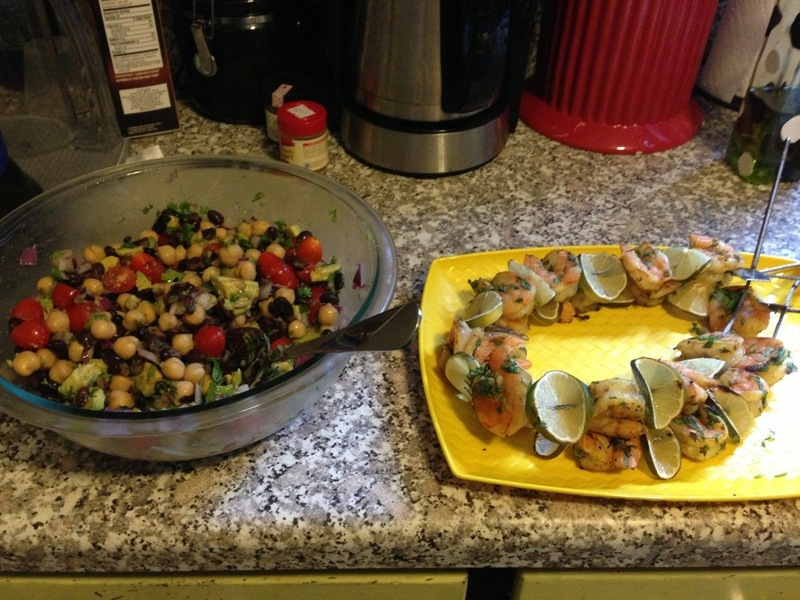 Once the shrimp were finished cooking, I added it to the salad, along with the avocado. If you are a person that really loves vinegar, you can also add some jalapeno flavored vinegar to this – it gives it just a little bit of heat with a bit more acidity and tang, that blends perfectly with the lime juice. This dish could go with absolutely anything with a Latin flavor to it; something tells me that this will make an appearance on our table another time this summer. We both agreed that this salad was great! It made quite a bit of salad, so much so that Mike was able to take some for lunch the next day. 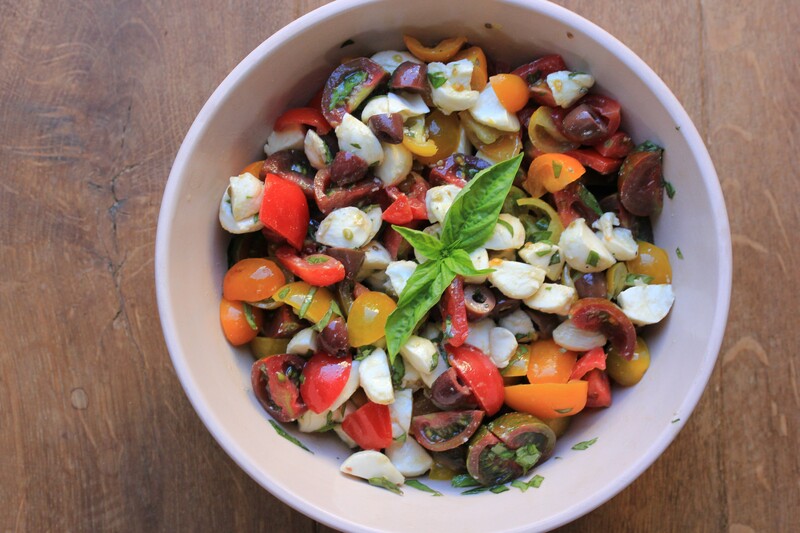 Perfect counterpoint to anything grilled – as you see in the picture and with my next post! I love how in the springtime, there’s new seasonal foods to add to your diet & cooking rotation, to really change things up a bit. Our CSA starts in about a month from now (yay!!!!) and I’m looking forward to that weekly box of farm fresh produce. Until then, I’m left to checking out the local grocery stores – our local organic food store does a great job of marketing local farms’ lettuces, carrots, and other vegetables that they’ve grown in their greenhouses. Now that it’s spring, vegetables are starting to taste better and I’m feeling a bit more adventurous. Salads are a quick and easy solution for dinnertime when you don’t feel like firing up your crockpot.This salad that I’m writing about today is, in a nutshell – EASY – using a few simple ingredients that you can find pretty much anywhere right now. I chose this recipe from the book The Cook & The Gardener by Amanda Hesser. It’s a cookbook as well as a documentary about spending a year in France. I absolutely adored it and plan on re-reading it this summer. I highly suggest that you check this book out – it’s got so many great ideas about using seasonal ingredients, and emphasizes that delicious food doesn’t have to be complicated. Heat the oven to 400*. 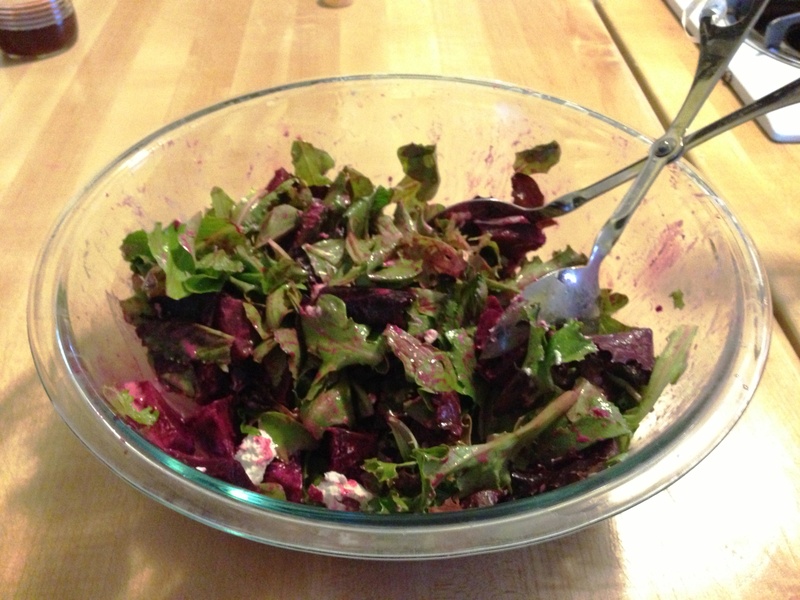 In a roasting pan, toss the beets with olive oil and a pinch of slat. Roast in the heated oven until the beets are tender; about 1 hour or so. Remove from the oven & let cool. Once the beets are cool, put on some latex or rubber gloves – or else your hands will stain from the beet juice. Peel the beets under cool running water and cut each beet in half through the root. Slice into wedges, and set aside. Place the lettuce in a large bowl. Then, in a small bowl, whisk the mustard, salt & pepper, and vinegar. Pour in the olive oil in a slow stream, and whisk quickly so that it emulsifies & creates a thicker dressing. Taste, then add more of the ingredients if you so desire. In another seperate, small bowl, crumble the goat cheese into small pieces. Season to taste with pepper. Add the chives and mix together until well-blended. Pour the dressing over the lettuce and toss to goat. 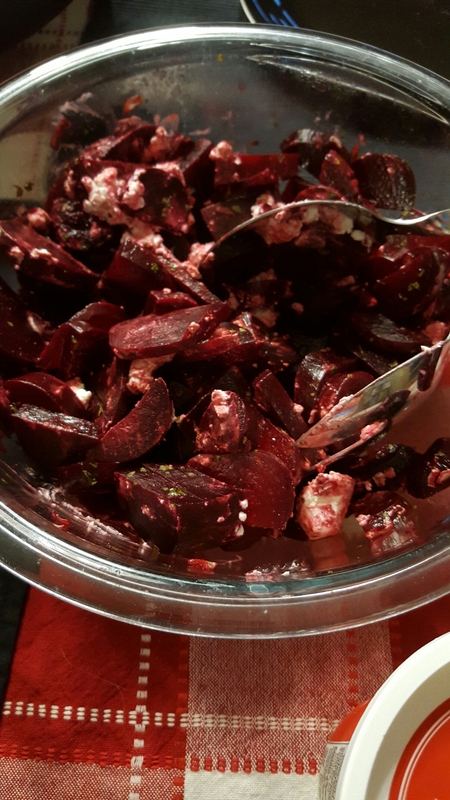 Add the beets & cheese to the bowl, and serve – you can either mix it all around, or just place them on top. This salad tastes very light and fresh. I’m in the process of experimenting with making my own salad dressings and this is a great recipe to get your feet wet, so to speak. 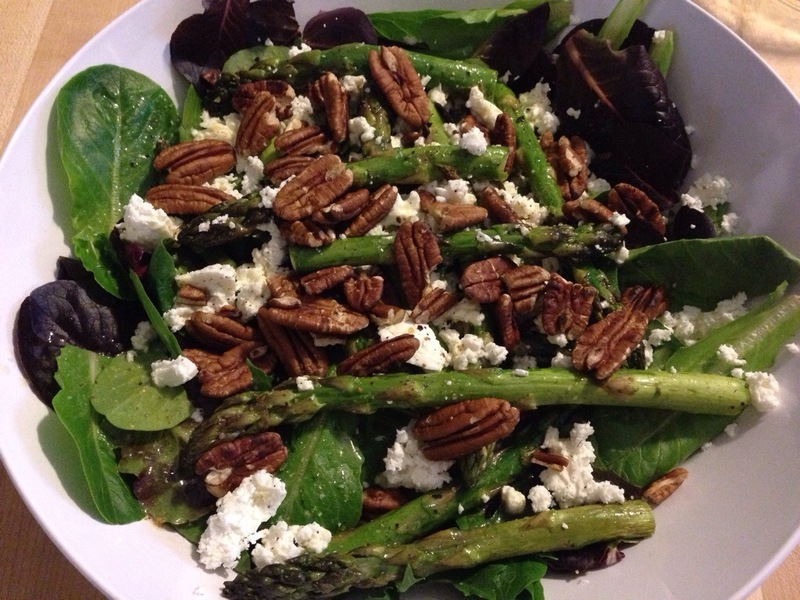 My husband was very impressed with this salad also and was surprised by how much he liked it, too. Beets tend to get a bad reputation and I’m not sure why. They’re actually pretty good! The only way I had really eaten them before this recipe was either pickled, or out of a can with catalina dressing (that’s how I ate them as a kid…I dunno, it was good). I think that this is my new favorite way to eat them – you can be sure that this recipe will come back once they’re back in my CSA box.